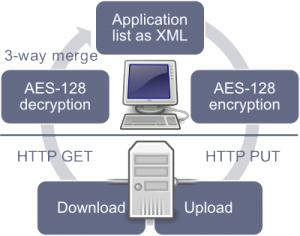 Download existing application list from the server if present and decrypt it. Merge the data from the server into the local application list using a three-way merge. Apply any changes made to the application list to the desktop environment. Encrypt and upload the new application list. Store a copy of the application list locally for use as a baseline for the next merge. All data is encrypted locally before transmission using AES-128. Therefore the server remains unaware of the actual data being synchronized. The communication with the server is handled via a simple REST interface which is documented at https://0install.de/sync/. Use our PHP script on your web server. Use an empty directory on a WebDAV server. Use a Windows file share.